A whole new experience for Pub & Restaurant Crawling in Las Vegas, NV! Let’s take a tour. You will LOVE Vegas Pub Crawler! Vegas Pub Crawler is the ultimate Las Vegas pub crawl! Whether it’s a birthday party, bachelor/bachelorette party, corporate event, wedding, or just because it’s Tuesday night; the Vegas Pub Crawler experience awaits you! Get together a group of up to 15 friends. The minimum amount is 6 friends. Great for parties! Reserve your preferred date by using our booking features. Weekends are most fun! Choose your Pubs! Give us a call for our best recommendations. 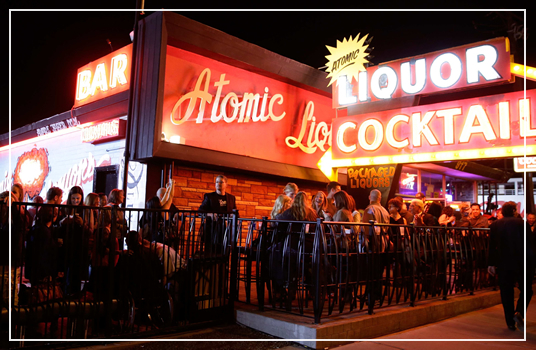 Meet at 206 N. 3rd Street in Downtown Las Vegas at the Downtown Grand’s Furnace Bar. We need a minimum of 6 people for a tour. With groups smaller than 6 people, we will need to add you to another party based on availability. Please text us for availability. Do you have drink specials? We are a pub crawling, bar hopping bike and have drink specials set up at most of the bars and range from $4-6 per drink. Unfortunately, the city will not allow alcohol on the bike. Please meet at 206 N 3rd St in Downtown Las Vegas just inside the Downtown Grand casino’s Freedom Beat bar and restaurant near the intersection of Ogden and 3rd St.
15 person PUB CRAWLING Party Bike! Same day booking based on availability, please text 702-706-5084. Minimum of 6 people required for tour but if you have a party of less than 6 then we can add you to another party based on availability. 20 person PUB CRAWLING Party Bike! Same day booking based on availability. Minimum of 8 people required for tour but if you have a party of less than 8 then we can add you to another party based on availability. Read to explore the best pubs & restaurants in Downtown Las Vegas? Learn more about each of our pub crawl stops here. 7 days a week from 12pm to 2am! Up to 15 Passengers! Great for special occasions! Of all the great things to do in Vegas, a great Pub CRAWL is what you need! The Ultimate Pub CRAWL on a 15 passenger bicycle is connecting the dots to all the Downtown Las Vegas’ hot spots. Over 10 Pubs to choose from. 2.5 hour crawls! We have over 10 of the finest bars and restaurants in Downtown Las Vegas and Fremont Street to capture your every need to choose from during your 2.5 hour CRAWL. 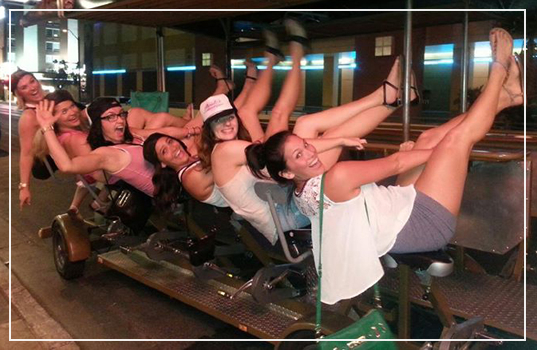 Have a question or need more information about the best pub crawl in Las Vegas? Fill out the form to the right or call (702) 706-5084 .